Here is another image from the same morning that I shared in the previous post, the light was wonderful that morning and it seemed like every image I captured came out great, don’t you wish every morning was like that. Clifty Falls is a wonderful place to photograph and to take part in many other outdoor activities, hiking in the park is always at the top of the list for the many visitors who use the park, if you are ever in Southern Indiana it is a must see location. Thanks for stopping by and taking a look and I hope you enjoyed the image. Been nearly one year since I posted anything to this site and a lot of that is due to a busy lifestyle, job, plain laziness but probably the best excuse was a heart attack and open heart surgery that I experienced on March the 27th. Yep I had the big one and followed it up with open heart surgery, it was the last thing that I ever expected to happen but happen it did. I really don’t want to get to deep into it the doctors already did that for me , but I have been given a great prognosis and I am continuing on with life with a few behavior modifications. I am very thankful for all the support from my family and friends and the great work by all the doctors and hospitals that put me back together again. So now on to something a little more to my liking and that is sharing some of my work with everyone, I don’t even know where to begin I have captured so many images in the last year but I guess I will just start posting some my favorites and go from there !! 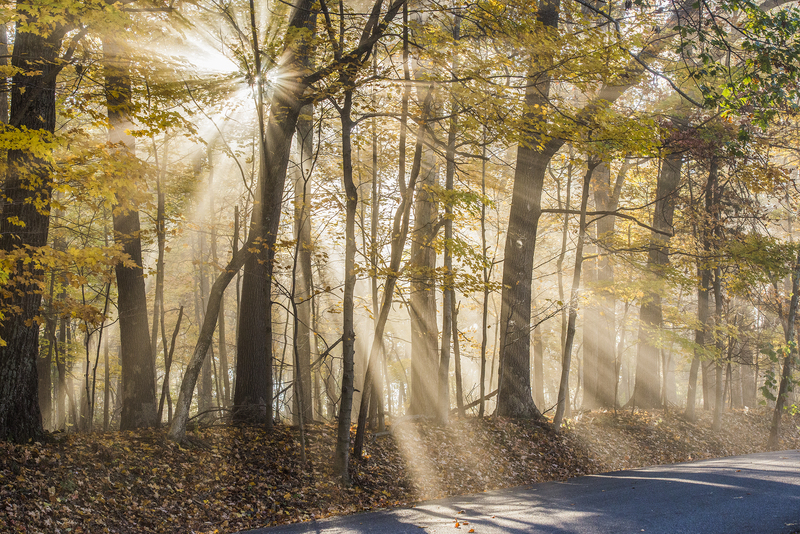 One from last fall at Clifty Falls State Park here in Madison Indiana, was a beautiful morning with all the sunbeams streaking down thru the fog that made for a surreal scene. 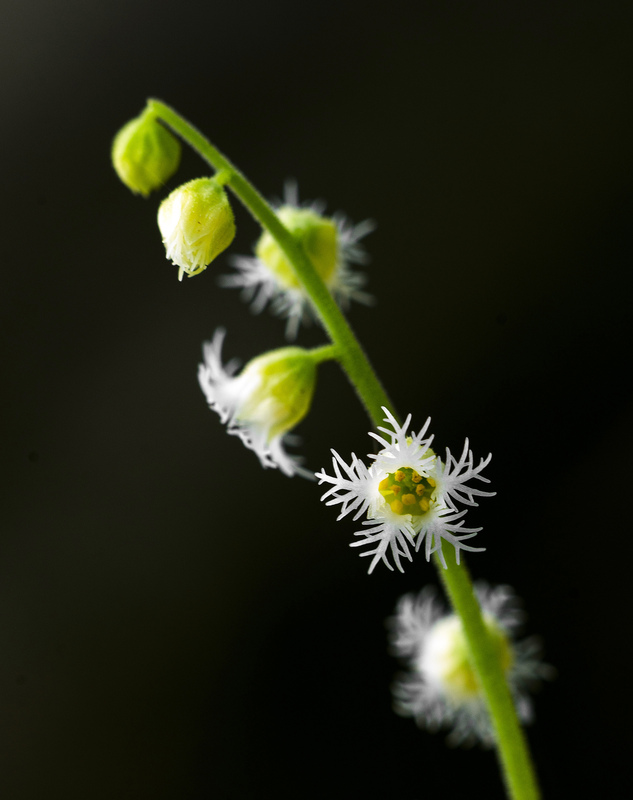 One of the coolest little wildflowers that I photograph is the Bishop’s Cap (Mitrewort) this is without a doubt the smallest wildflower I have ever captured. The bloom itself is about the size of a pea and it grows on about 6 inch tall slender stems any slight air motion will cause them to sway, which makes photographing these species one of the hardest I have attempted. 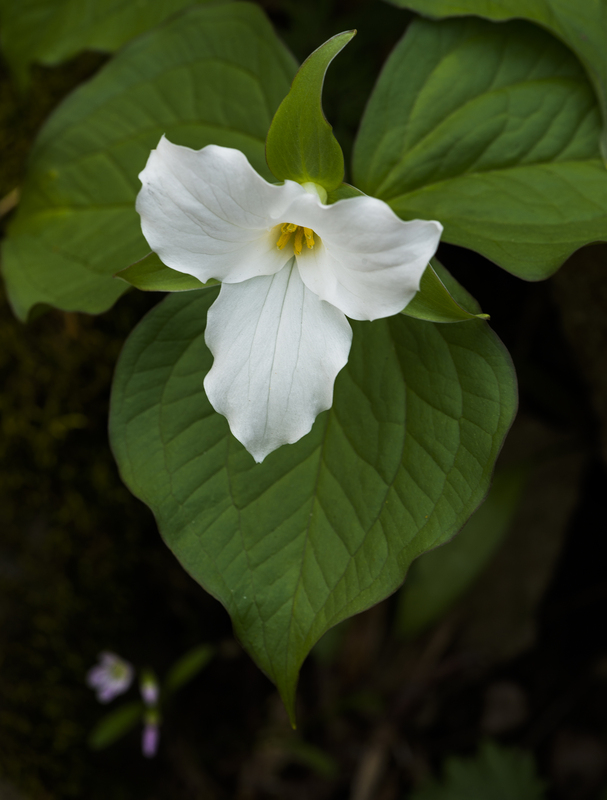 They bloom in early to mid April and love the deep forested canyons of Clifty falls State Park, you can also find them in the heavily forested areas that cover many parts of our county. The bloom itself is very beautiful and has a very cool structure to it. Photographing this wildflower definitely requires a tripod and somewhat fast shutter speeds, a macro lens as well will give you the best results. And probably the most important aspect of getting the best shot is patience and lots of it. As I said before not just wind sends this subject into a shake but any air flow at all will keep this wildflower moving for long periods of time even in what you may think are calm conditions. 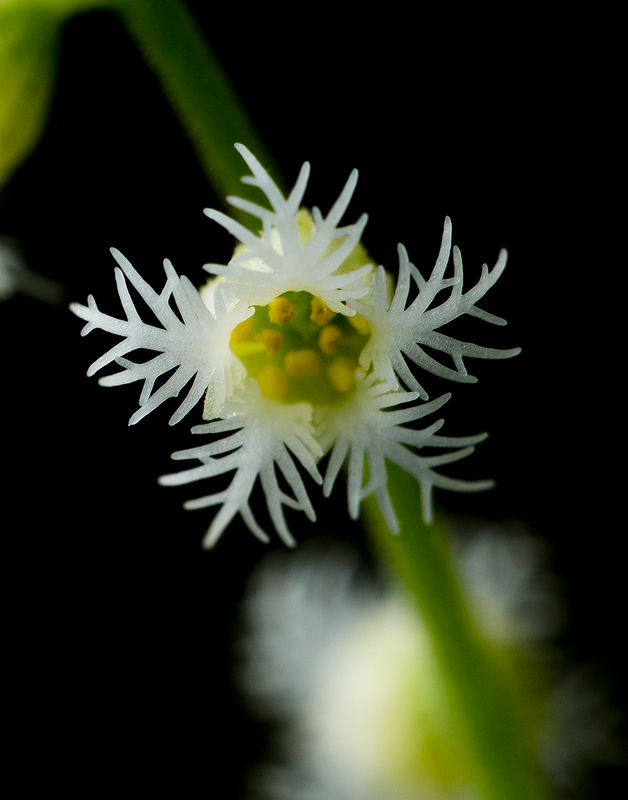 Here is what I think is probably my best shot to date of this little gem, I am posting the first one as the actual plant size and the second image is a cropped version and as you can tell it is a bit soft from air movement. I hope you enjoy the images and description and thanks for stopping by !! 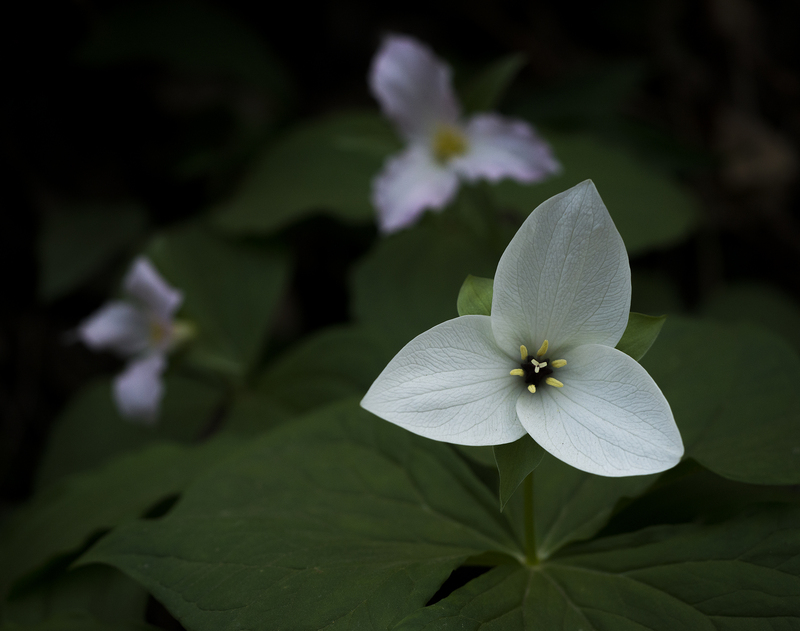 Here are a couple more images of one of the many wildflowers that inhabit Clifty falls State Park near Madison Indiana. Clifty Falls is one of the best parks in the state of Indiana not only for wildflowers but for the outstanding hiking, wildlife viewing and views of the many waterfalls that line the canyons and gorges of this wonderful tract of land. 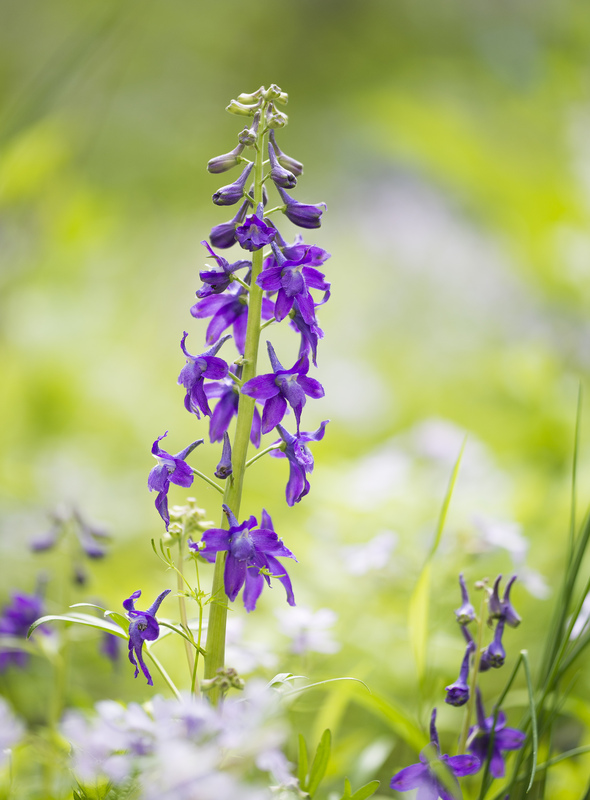 The Larkspur is a slender, upright perennial, with unbranched stems from 1-2 ft. tall. White to pale blue, spurred flowers in a narrow cluster on a finely downy stalk. Pale blue to white, spurred flowers appear in a narrow, terminal spike. Leaves are divided and lobed into narrow segments. Basal leaves often form a winter rosette which withers before the flowers open. The Spanish name is Espuela del caballero from its resemblance to a horsemans spur. When in flower, this midwestern species can carpet acres of prairie before the grasses take over. Plains Larkspur was once considered to be a separate species, D. virescens, but studies of variation in larkspurs have now classified it as a subspecies of the widespread Carolina Larkspur, D. carolinianum ssp. virescens. The species, with three subspecies, ranges from the eastern edge of the West to the southeastern United States. Some phases may be blue. Larkspurs intergrade among species, and flower color varies from white to pale or dark blue in some species, making them difficult to classify and identify. Most blue-flowered species have white-flowered variants, and a few are consistently white or very pale blue. The geographic range of the white-flowered Wooton’s Larkspur (D. wootonii) overlaps with that of Plains Larkspur on the plains of eastern Colorado and southwestern Nebraska, but most of its range is to the south and west, to southeastern Arizona and western Texas. Wooton’s Larkspur usually has leaves mostly at the base and reflexed sepals, whereas Plains Larkspur has leafy stems and spreading sepals. Also white-flowered are Alkali Larkspur (D. gypsophilum), found in the San Joaquin Valley and the southern Coast Ranges of California; Peacock Larkspur, a hybrid between D. menziesii subsp. pallidum and Cow Poison (D. trolliifolium), with brightly glandular-hairy petals, found in western Oregon; and Pale Larkspur (D. nuttallii ssp. ochroleucum), without glandular petals, found in the vicinity of Portland, Oregon. 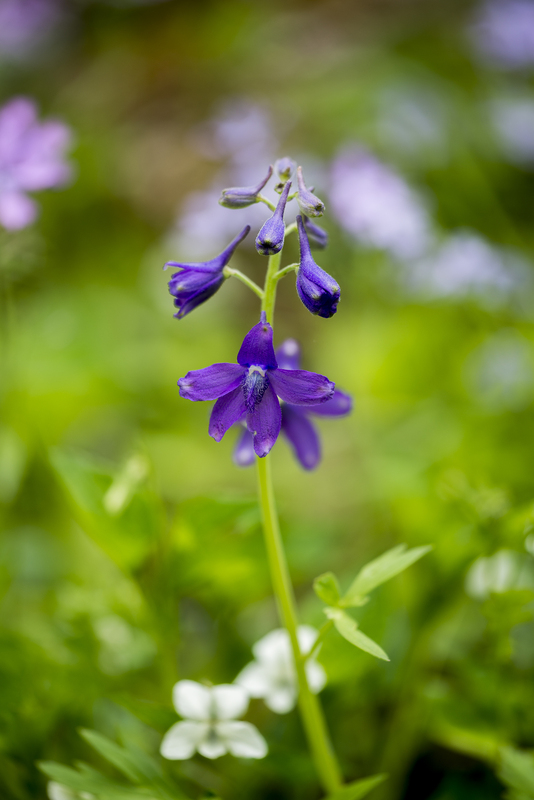 And now for a couple images of the Larkspur, thanks for stopping by and taking a look !! Three posts in a week how about that. I am starting to get caught up again which is leaving me time to post here, problem is in mid July it will be starting again with the weddings, but hey it helps pay the bills !! 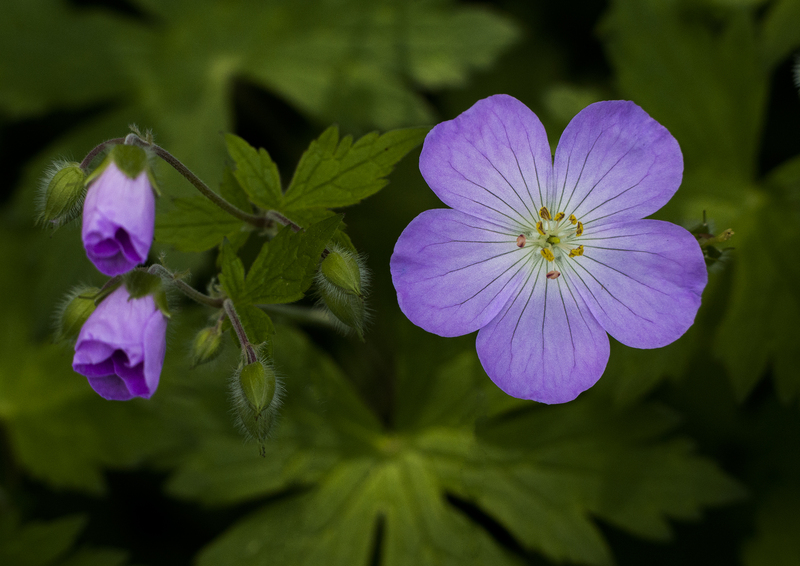 So here is another wildflower image, this time I photographed the Wild Geranium at Clifty Falls State Park near Madison Indiana. And once again since I am too lazy a description according to Wikipedia.. Geranium maculatum, the spotted geranium, wood geranium, or wild geranium is a woodland perennial plant native to eastern North America, from southern Manitoba and southwestern Quebec south to Alabama and Georgia and west to Oklahoma and South Dakota. It is known as Spotted Cranesbill or Wild Cranesbill in Europe, but the Wood Cranesbill is another plant, the related G. sylvatium (a European native called “Woodland Geranium” in North America). Colloquial names are Alum Root, Alum Bloom and Old Maid’s Nightcap. 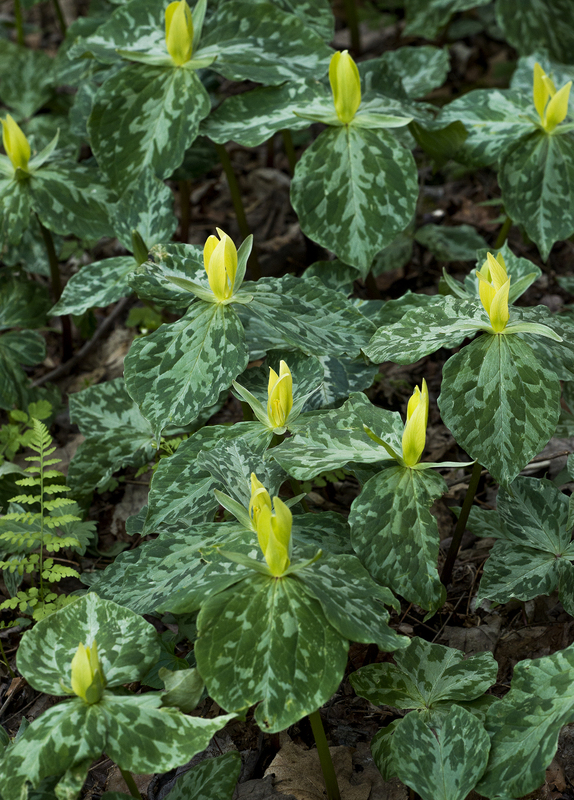 It grows in dry to moist woods and is normally abundant when found. It is a perennial herbaceous plant growing to 60 cm tall, producing upright usually unbranched stems and flowers in spring to early summer. The leaves are palmately lobed with five or seven deeply cut lobes, 10–12.5 cm broad, with a petiole up to 30 cm long arising from the rootstock. They are deeply parted into three or five divisions, each of which is again cleft and toothed. The flowers are 2.5–4 cm diameter, with five rose-purple, pale or violet-purple (rarely white) petals and ten stamens; they appear from April to June in loose clusters of two to five at the top of the stems. The fruit capsule, which springs open when ripe, consists of five cells each containing one seed joined to a long beak-like column 2–3 cm long (resembling a crane‘s bill) produced from the center of the old flower. The rhizome is long, and 5 to 10 cm thick, with numerous branches. The rhizomes are covered with scars, showing the remains of stems of previous years growth. When dry it has a somewhat purplish color internally. Plants go dormant in early summer after seed is ripe and dispersed. The plant has been used in herbal medicine, and is also grown as a garden plant. 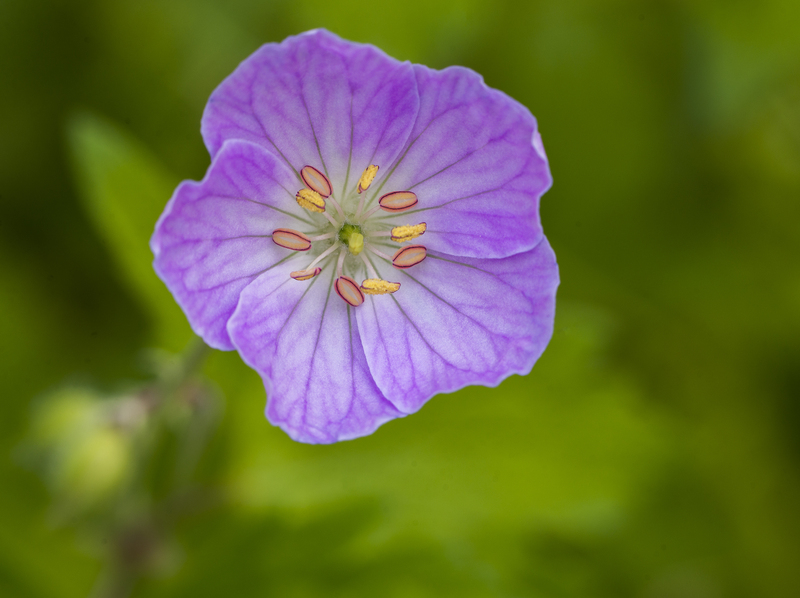 Wild Geranium is considered an astringent, a substance that causes contraction of the tissues and stops bleeding. The Mesquakie Indians brewed a root tea for toothache and for painful nerves and mashed the roots for treating hemorrhoids. 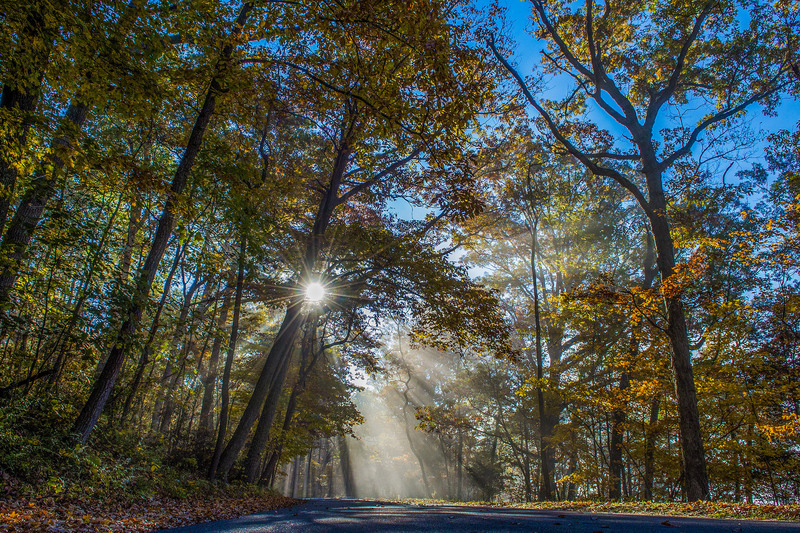 Hope you like the description and the image thanks for stopping by and taking a look !! 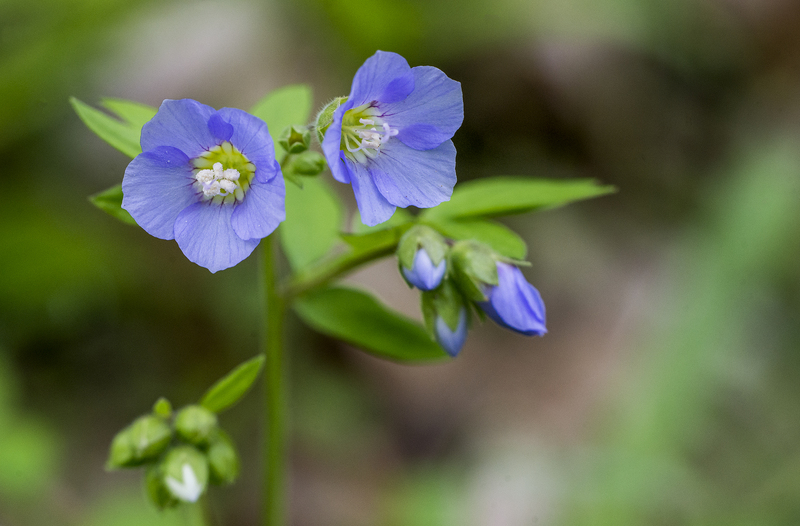 Jacob’s Ladder is another great little blue wildflower that grows at Clifty falls State Park in Madison Indiana. I photographed these little beauties along trail one coming down from the old watchtower that overlooks the Ohio River. Now here is the image of the Jacob’s Ladder, hope you find the description and image helpful in your next wildflower hike or photographic endeavor.